2 Bedroom Detached Bungalow For Sale in Boston for Asking Price £169,950. 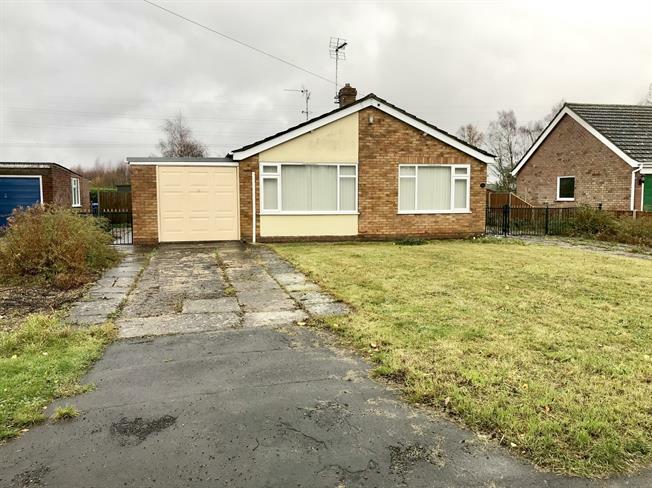 Available with no chain and occupying a deceptively large plot, this two bedroom detached bungalow is situated in a popular location on the outskirts of town. Needing some modernisation, the property benefits from two reception rooms, kitchen and shower room as well as two good sized bedrooms. Externally there is ample off road parking, a single garage and a large rear garden that needs attention but offers fantastic scope. Double glazed window to rear. Having a range of fitted wall and base units, single bowl sink and drainer unit, integrated electric double oven, integrated four gas hob with over hob extractor, integrated fridge, space for washing machine. Ground level warm air heater, ceiling light point, power points and uPVC side door. Double glazed window to rear. Comprising three piece suite of low level WC, single enclosure shower cubicle with wall-mounted electric shower and pedestal sink. Heated towel rail, ceiling light point and tiled flooring. Up and over door, power and electric. To the front of the property there is a driveway to the left hand side providing off road parking for two cars and access to a single garage. A small lawned garden sits to the right hand side of the drive and is bordered by a further driveway. There are gates to both sides of the property providing access to both side doors and to the rear garden. The rear garden is large, incorporates a good sized patio area and is fully enclosed to all sides by timber fencing and conifer hedging to the rear.